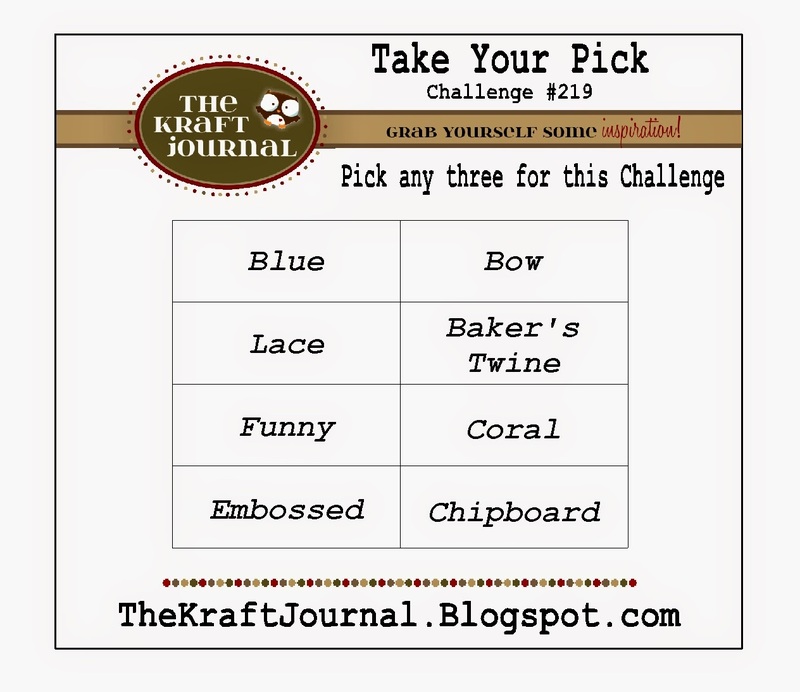 It's Take Your Pick week at The Kraft Journal! Yay! I always enjoy these! They are so fun! Basically, you can go with any theme or occasion as long as you pick THREE things from the list below and use Kraft cardstock or items that can be purchased from The Kraft Outlet. I have a Basketball themed birthday card to share this week! I started by creating a 5 x 5 card base of Brown Kraft Cardstock. I then adhered patterned paper to the base which incorporated the color coral. Another of the pick three this round is to use Blue, so I incorporated it as the liner to my patterned paper strip as well as the star. The star base is created from Chipboard. I stamped my sentiment inside my star and added a cute "funny" face at the top from Peachy Keen Stamps. I cut the basketball and hoop from the Sports Mania Cricut Cartridge. I took a length of Orange Baker's Twine and wrapped it around the card front and tied in a Bow. A final embellishing touch was adding a few enamel dots. Please join us with your creations this week. Here is what you have to choose from for the Take your Pick! Please be sure to head over to the The Kraft Journal to check out the projects by the other talented ladies. 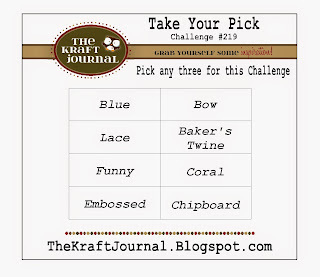 We hope to see your Take Your Pick creations in the gallery this week for your chance to be featured on our "Feature me Friday" post as well as be entered to win a $15.00 gift voucher from The Kraft Outlet store. Such a CUTE kid card, Tammy! Love the sport theme and all the fun die cuts, and that little face on the star just makes me smile! Love love love this! LOVING the hoop and basketball!!!!!! Such a great card Tammy - love it! Oh so cute, Tammy! The grin on that star is just so darn fun! I hope to have time to play along with this weeks' challenge. Thanks for the inspiration!! Happy Monday! That is one fantastic sports themed birthday card. Super fun! Fabulous card, love how you added the sentiment and the Peachy face! Pretty colors and papers too! How FUN!! Perfect masculine design and I like the little winky face on the star!! Hi Tammy! I am SO happy to be visiting you tonight! My mom is recovering well and I will soon be returning to crafty Blogger fun. How is your shoulder? I've missed you and your creations. Speaking of which, everything you've made is amazing.. including this all-star card! I love the cuts and the huge star. Perfect papers for the theme, too! Wonderful work as always, my dear friend. Thank you for sticking with me while I've been away for so long. Such a great card for any kid who loves sports!